We live in the era of dialogue, an era Leonard Swidler helped birth. The son of a Jewish Ukrainian immigrant and an Irish Catholic, he set out as a boy to become an intellectual and a saint. There Must Be YOU explores how and why this aspiring Norbertine priest emerged to become the Professor Swidler of today: a teacher, a reformer of the church, a preeminent feminist, and one of the fathers of interreligious dialogue. He argues passionately that dialogue is a matter of more than peacemaking, but of living an authentically human life. Len's journey begins at the start of the Great Depression, and represents the very turmoil and growth of American modernity: our search for faith, our struggle with diversity, and our fight for social justice. Written by Len's colleague and friend, this book offers the reader education, inspiration, and challenge through the remarkable stories of Len's life, conversations with him, and excursions into the history of the world that made him who he is. We turn the last page having laughed with Len and argued with him, and having dialogued more deeply with our own lives. ""River Adams has written a beautiful and thought-provoking intellectual and spiritual portrait of my dear former colleague, Leonard Swidler, whose efforts to become 'an intellectual and a saint' have affected the world of scholarship and quest for peace in enormous yet humbling ways. This wonderful narrative unfolds with the poetic and ambiguous force of grace as Adams offers insights into Swidler's precious world of dialogue, which, for him, has all the relational force of Buber's understanding of what it means to transform others into the infinite and infinitesimal you."" --Lewis R. Gordon, author of Existence in Black ""This creative, well-written, and unique biography is a spiritual gift to our times, a teaching tool, and an introduction to one of the great thinkers of the day. It is Len Swidler's biography, but it is also a cultural history of the era, and a call to all of us to revisit our religious-intellectual roots. There can be no greater or more necessary intellectual challenge than that in this mercurial time."" --Joan Chittister, author of Following the Path ""This is a stimulating biography of a leading Catholic theologian and teacher who has influenced global religious thought on interfaith dialogue... . Swidler's intellectual journey has been a continuous development in conversation with other leading Catholic intellectuals of the last half century, and thus we also are introduced to these leading figures and their thoughts, through Leonard Swidler's life. This is a page-turner that inspirers the reader to read on to complete the journey."" --Rosemary Radford Ruether, author of Sexism and God Talk ""Leonard Swidler has been a fixture of American religious, Catholic, and intellectual life for almost fifty years since his founding of the Journal of Ecumenical Studies. Swidler ranks dialogue among the supreme values of this world; his brilliant formulation of its rules amount to an implicit religious anthropology. This splendid book uniquely folds 'live' conversation with Len into the narrative of past events to create a personal dialogue. The book is moving and irresistible."" --Roger Haight, author of Spirituality Seeking Theology River Adams grew up a classically trained pianist in Soviet Russia, came to America as a Jewish refugee, and became a Christian by way of conversion. She is an alumna of Harvard Divinity School and a former Assistant Professor of Catholic Studies at Rosemont College. She writes on biblical themes and on themes of peace and justice, and she runs a blog on faith and theology OnMountHoreb.com. 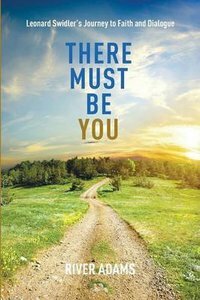 About "There Must Be You: Leonard Swidler's Journey to Faith and Dialogue"
River Adams grew up a classically trained pianist in Soviet Russia, came to America as a Jewish refugee, and became a Christian by way of conversion. She is an alumna of Harvard Divinity School and a former Assistant Professor of Catholic Studies at Rosemont College. She writes on biblical themes and on themes of peace and justice, and she runs a blog on faith and theology OnMountHoreb.com.